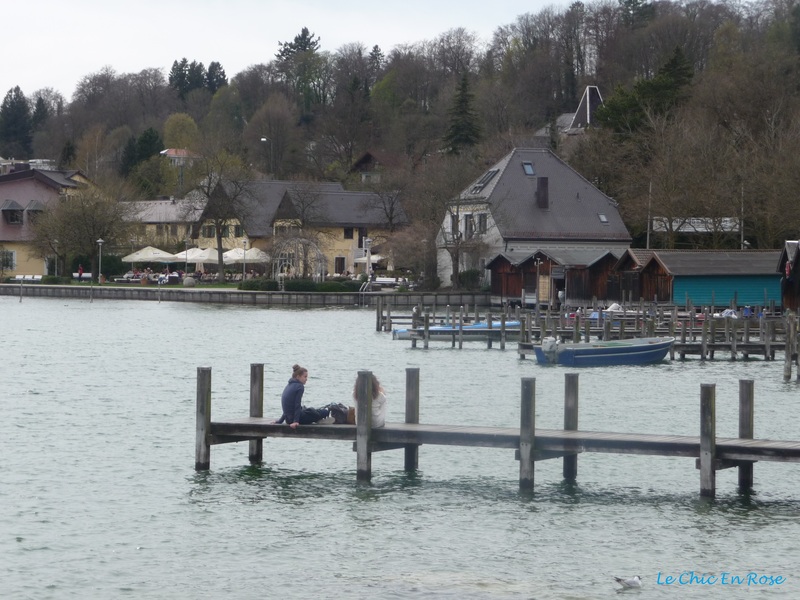 As I mentioned in last week’s post about having the flu in Munich, we only went to Starnberger See on the off chance, mainly because we were feeling too ill to go round museums or visit castles and other tourist attractions! The small town of Starnberg is situated at the northern end of the lake and is only about 30 kms south west of Munich. 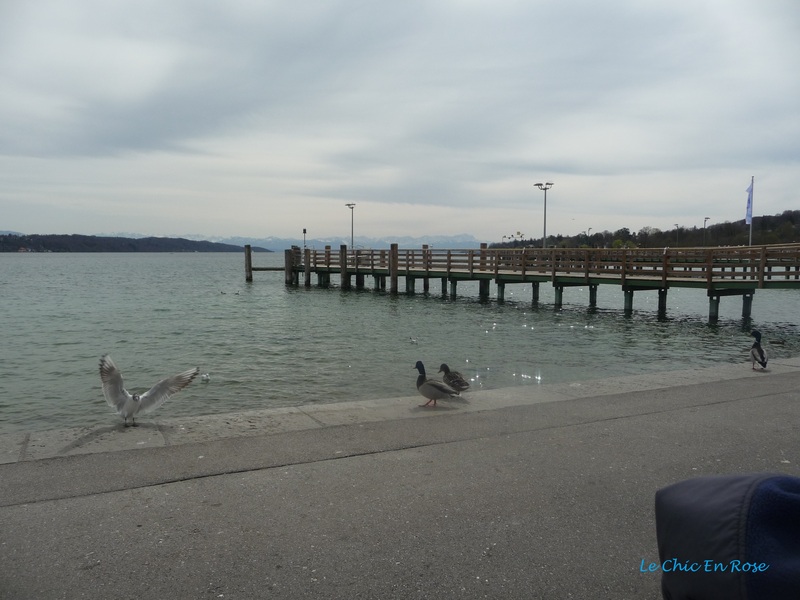 We caught the S6 S Bahn line from the city centre and a pleasant half an hour or so’s ride later we alighted at Starnberg station very conveniently situated adjacent to the lake. Just make sure you have a valid ticket (Fahrkarte) for the correct zone. The inner city zone runs out at Planegg and we had to get off here to buy an extra ticket to take us to Starnberg (fortunately we did this voluntarily not after being asked to by Deutsche Bahn staff and yes they do regularly patrol the S bahn for fare dodgers!). We could see why Eyewitness Travel, Top Ten Munich, recommends Starnberger See as a popular day trip escape from the city. 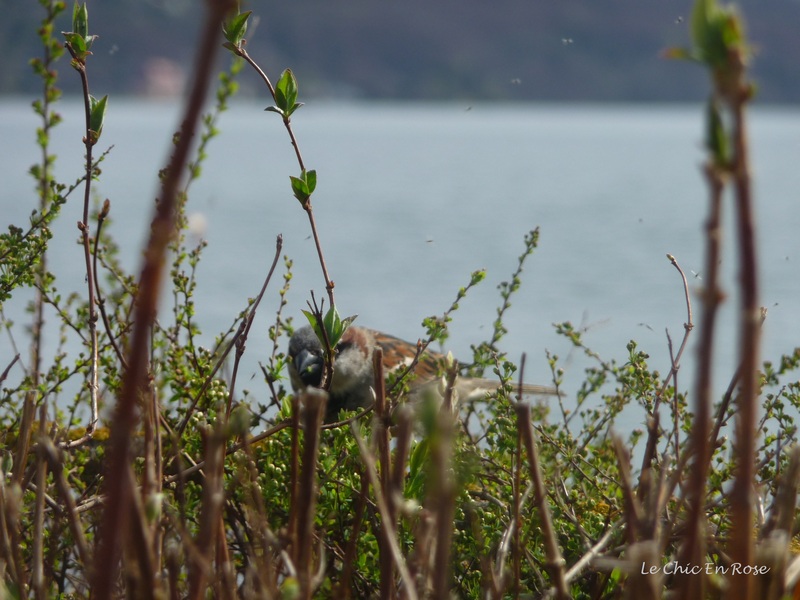 We had a lazy lunch by the lake looking out to views of the Alps in the distance and being serenaded by the local bird life who no doubt were hoping for some scraps from the table! I am sure it would be busier in the main summer season but it had a peaceful and chilled out vibe on the day we were there in April. Cafes, restaurants and beer gardens are dotted around the lake. There are also plenty of boat moorings, which make excellent spots to laze and watch the world go by. Not surprisingly boat trips are a popular way to get around the lake – these only operate between April and October however. Full details of the pleasure boat schedule on Starnberger See and other Bavarian lakes can be found here. Apart from just enjoying the fresh air and views, the boats can ferry you round the lake stopping off at various places of historical interest, including some castles. The local nobility built many fine summer residences in the area in days gone by. The Empress Elisabeth (Sisi) of Austria, who was a Bavarian princess before her marriage, spent her summers at Possenhofen just a bit further along the lake from Starnberg. You can also go by S Bahn to the end of the line at Tutzing where there is another castle (Schloss) and fine views of the Alps. The stations at Possenhofen and Tutzing, however, are situated a bit further inland – not too far though! Whilst normally we would have been happy to walk down to the lake, we were feeling a little fragile in our flu-ridden state so gave them a miss. 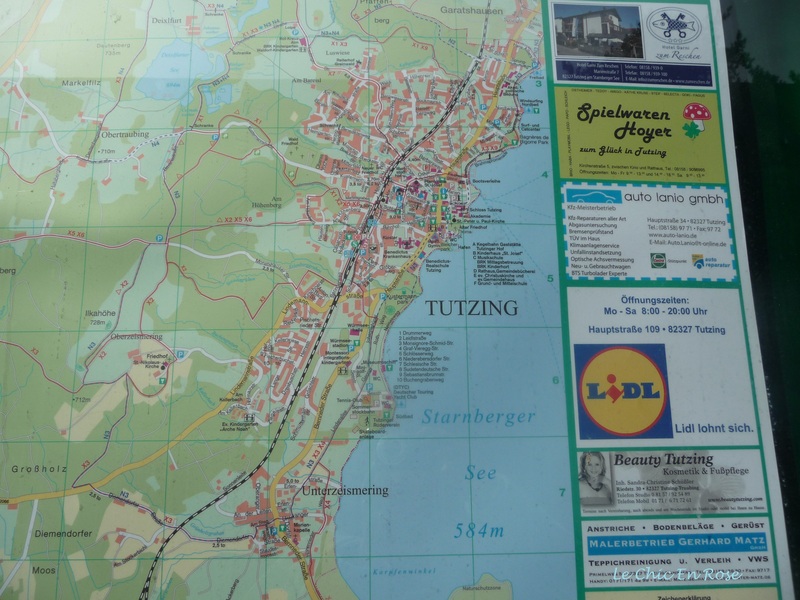 In case you ever visit the region, however, here is a map of Tutzing I picked up at the station! One special place of historical interest that we will also have to wait to visit another time, is a memorial at Berg, a little town on the opposite side of the lake from Starnberg. Here on 13th June 1886, Ludwig II of Bavaria went off on an evening walk with his personal physician, Dr von Gudden. Ludwig had been deposed as king the day before on the grounds of unfitness to rule and banished to Berg Castle under the care of von Gudden who was a noted pyschiatrist (and the man who had labelled Ludwig mentally ill). Later that night both men found were found drowned in the lake. Many conspiracy theories abound – murder, assassination, murder/suicide but the mystery has never been solved. The spot where the men were found is now marked by a commemorative cross in the water – a poignant tribute for the man who has become known as the “fairytale king” for his legacy of romantic and spectacular castles (more to come in future posts about the castles!). Walking, swimming, water sports, boating or just enjoying a lingering lunch – these are just some of the many reasons to take a trip out to the peaceful and idyllic Starnberger See. Join me for more explorations of Munich and its surrounds next week. Tschuss until then! Never been here Rosemary in all my trips to Munich. Will have to put that right sometime soon as it looks lovely, you could hardly imagine this is only a half hour ride from the centre of the city. Good time of year to visit as well, definitely better without all those crowds I’m sure the summer would bring! Thanks Joy – it’s so often the way we often miss attractions despite visiting a place often or even living there! It would be packed in summer I would imagine as it is so convenient to get to from Munich. Spring was a great time to visit – it was still a bit chilly (for me anyway but I did have the flu) but the sun had some warmth and it was just lovely sitting by the lake on the cafe terrace! I think it would be a lovely spot for a long weekend too! I don’t know why, but I wasn’t expecting lakes over there. It makes me think about Geneva. I can imagine myself on one of these terrace.. 😉 Did you try special beers over there ? There are actually quite a few lakes in this area and yes it is a bit like Lake Geneva except Munich itself isn’t actually on the lake so it’s less built up. The cafe terraces were wonderful! I am not a beer drinker myself (prefer wine!) but Monsieur Le Chic is and he tried all sorts of the special beers once he got over the flu – I’ll have to ask him which ones he preferred! I don’t really like strong beers, I prefer the cherry beer or all fruit beers (peach, apple, raspberry, etc) or ciders ! As for the wine… most of them give me headache, so I try to avoid them as much as possible. The fruit beers sound delicious – if I did drink beer I’d drink these. I find as long as I drink good quality wine I’m fine I think the ones with preservatives can give you headaches. Thanks Lucy yes it was a lovely place – very tranquil and we felt better being outside and enjoying the fresh air. The cafe was right by the lake – a great spot to have lunch 🙂 Hope you’ve had a lovely weekend too! I find it so nice that you took the time to go to Starnbergersee, it is one of my favorite places around here!! Yes! I need to try a boat trip on the lake sometime… maybe this summer would be a great idea! I hope you have a great week! !